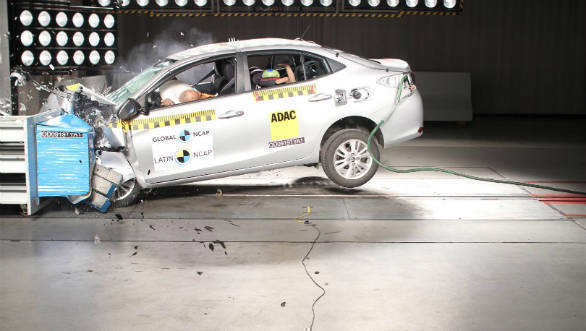 The Brazil-spec Toyota Yaris has received a four-star safety rating from testing agency Latin NCAP. The Yaris sold in Brazil is the same as the Indian car but gets two airbags against the seven airbags available here. Electronic stability control is standard on the Brazilian car but not ABS. 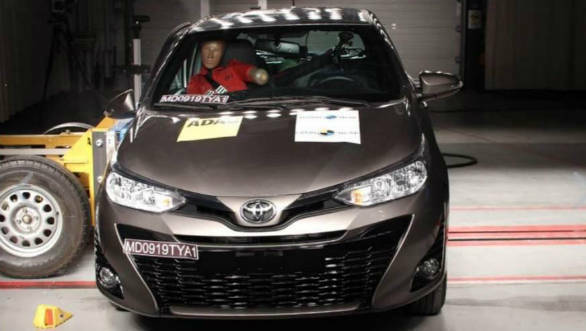 The test notes say that in a frontal impact the driver and passenger's head and neck were well protected. The passenger's chest was also well protected but not the driver's. Driver and Passengers knees didn't fare as well as they can impact dangerous structures behind the dashboard. A major downside was that Footwell area was rated as unstable as there is risk of intrusion in the feet area. The body shell was rated as unstable. The Yaris scored 11.23 points out of a possible 16 in this category. In a side impact the Toyota offered good protection to the occupant's head and pelvis while abdomen and chest showed adequate protection. It scored 14.76 out of 16 in this test. The Toyota Yaris competes with the Honda City and Hyundai Verna. But unlike those two, Toyota is only offering the Yaris with a 1.5-litre VVT-i petrol engine generating 107PS and 140 Nm of torque. A CVT and a six-speed manual are the gearbox options.